Combining rural and urban areas, the report, titled “Blind Spots to the Polio Eradication Endgame: Measuring the Limitations of Polio Vaccination Delivery in Dalit Communities in Gujarat, India”, prepared in January 2013, finds that on the whole 15.8 per cent Dalit missed in polio vaccination campaigns (15.8 per cent), as against non-Dalit children’s 6.0 per cent. The report comments that this is happening “despite the extensive pulse polio campaign in India”. Things are especially bad in ”traditionally marginalized communities living in hard-to-reach areas… “Although some non-Dalit children are also missed in these remote areas, the very high rate for Dalits raises notice that the endgame of polio eradication is at risk if greater monitoring is not directed at Dalit communities. With 25 million Dalit children age six and under living in India, a 15.8 per cent rate of missed children could extrapolate nationally into nearly four million, a significant roadblock to the goal of polio eradication”, it adds. 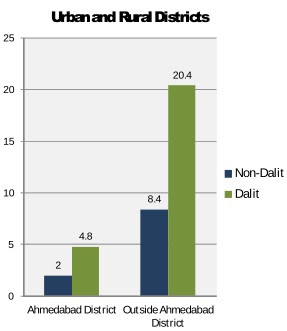 Saying that “untouchability practices” contributed “significantly” in a higher rate of missed vaccinations among Dalits over non-Dalits, the study compares vaccination data of the Dalits with that of Other Backward Castes (OBCs) in the rural areas. The premise is: Families from the OBC castes have income levels closer to Dalit families than to non-Dalit families, yet they do not experience untouchability in the way that Dalits do. 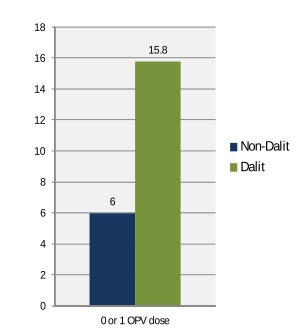 Based on this similarity in income levels, but dissimilarity in untouchability status, “it was hypothesized that Dalit children would have similar levels of missed vaccination as OBC children if family income were a significant contributing factor to these rural children being missed by the pulse polio campaign”, the report says. 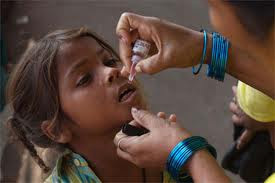 The survey data suggest that “the rate of missed vaccination by Dalit children far exceeded the rate of OBC children, with the latter missing vaccinations at a rate similar to non-Dalits. “Based on this divergence between income levels and vaccination rates, it can be argued that untouchability has a greater bearing on the likelihood of missed vaccination for the poliovirus than economic status”, the report says. Such Data Based Studies Expose BJP and Narendra Modi Fakism on Developments.